Studio Visit Magazine Vol. 41, Pages 18-19; 2018. Needham Hometown Weekly, "Bruckner, Muthukaruppan Showing At Open Studios," April 5, 2018. Boston Voyager Magazine, "Flashes & Strokes: A Tale of Two Mediums", March 13, 2018. Artsy Shark Featured Artist, www.ArtsyShark.com, December 21, 2017. Boston Voyager Magazine, "Boston's Most Inspiring Stories"
​"Meet Eddie Bruckner of Eddie Bruckner Fine Art in Needham" September 18, 2017. The Needham Channel, "Needham Open Studios 2017" May 12, 2017. ​Studio Visit Magazine Vol. 35, Pages 30-31; 2016. WEBN-TV News "Eddie Bruckner's Boston Themed Piano a Hit at City Hall Plaza" Reported by Priscilla Liguori, September 26, 2016. ​Boston Herald "88 Keys to Having Fun" Page 19, Saturday, September 24, 2016; Vol. 34, No. 268. WHDH 7 News: Eddie Bruckner's Painted Street Piano "Play Me, I'm Yours, Boston" September 23, 2016. 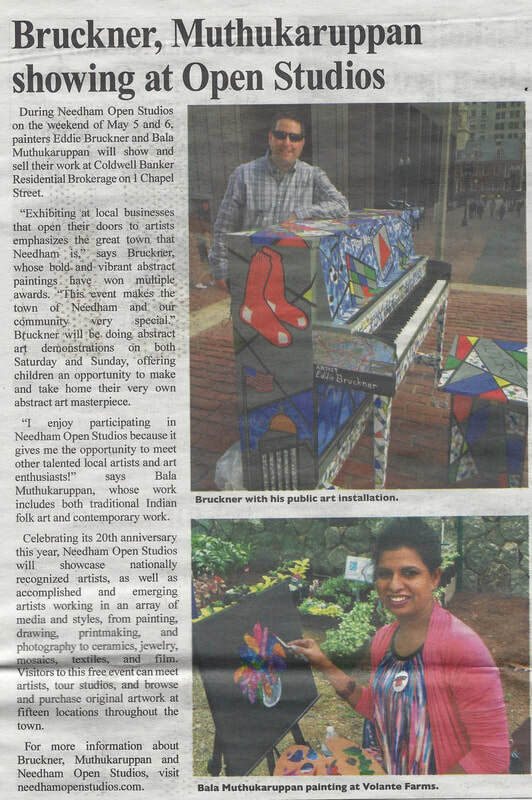 The Needham Times, Front Page, "Piano as Public Art: Eddie Bruckner's Work Featured in Boston Show"
​Thursday, September 22, 2016; Vol. 50, No. 38. Artsy Shark Online Article Feature “Love of Color” August 2016. Television Interview on “It’s All About Arts" Boston Neighborhood Network Television. May 9, 2016 Episode. "Artist of the Week: Interview with Eddie Bruckner" Lisa Koschwitz Salerno Art Blog. April 30, 2016. Click Here for Link to the Podcast! 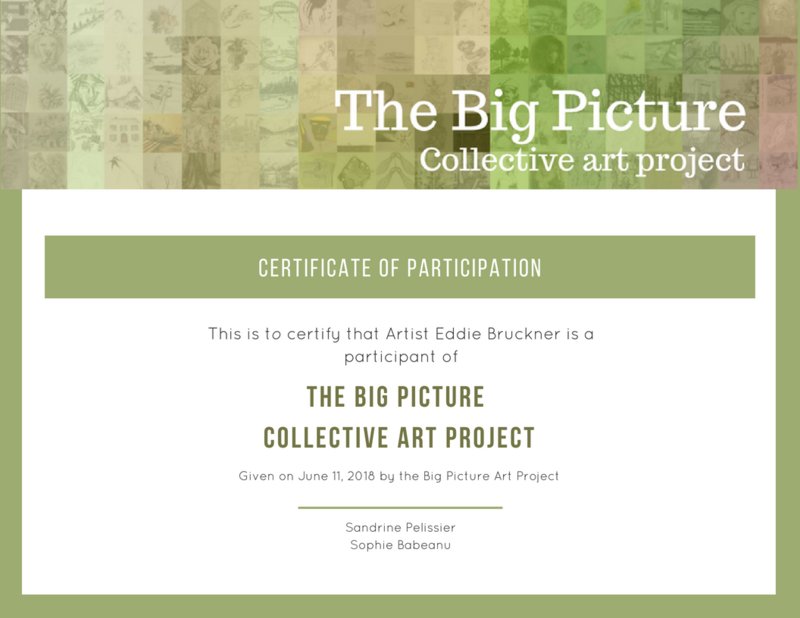 Click Here to Read About Eddie's Participation In The Big Picture Art Project! Eddie Bruckner Appeared On Live Television, May 9, 2016. Eddie was interviewed on"It's All About Arts" the popular and entertaining one hour live television show on the Boston Business Network featuring guests from a wide variety of art related fields throughout Greater Boston. Watch the Video Here! The whole show is great, but Eddie Bruckner is featured starting at 38 minutes and 45 seconds. 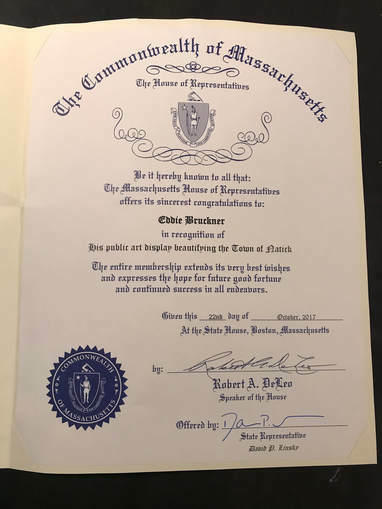 Eddie Bruckner's certificate from the Massachusetts House of Representatives ​in recognition of his Natick, MA public art project.